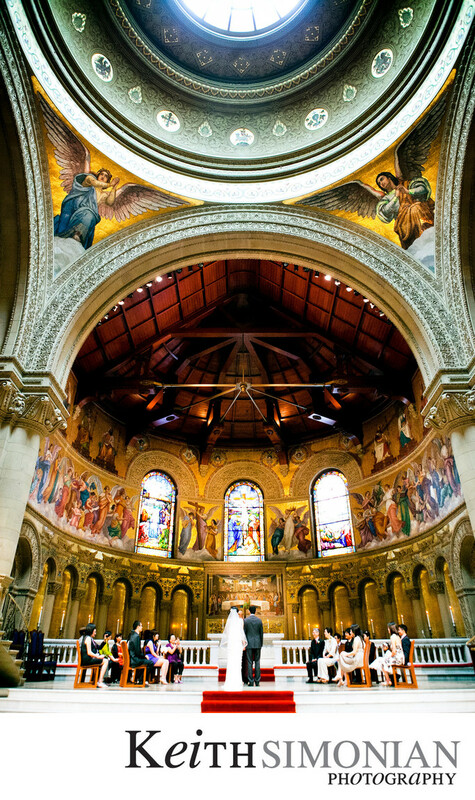 This vertical photograph during a wedding ceremony at the Stanford Memorial church shows the stained glass windows, angels, and dome that grace the church. For a small wedding party such as this wedding the church will sometimes allow the wedding photographer to come up to the edge of the steps to capture the details. For a larger wedding and wedding party the rules of the church state that the photographer must take photos from behind all the seated guests. Location: Memorial Church 450 Serra Mall Stanford, CA 94305.